"House Cleaning is for the Birds"
Does your bluebird house need to be cleaned? It is that time of year to help the birds. 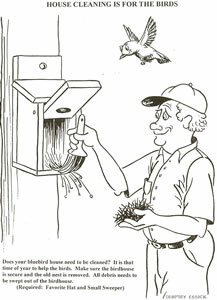 Make sure the birdhouse is secure and the old nest is removed. All debris needs to be swept out of the birdhouse.